For a college interview approximately twentysomething years ago I was asked what my photographic ethos was. I was stumped by the question, and to this day I’m still not sure what the interviewer meant, but the question did the trick; I failed the interview and didn’t get a place on the course. Strangely though I’ve found myself considering not my ethos, but my motivation and a conversation I had with someone I was photographing today brought the subject back to the foreground of my mind. He was telling me about an incident in Bangladesh which confronted him with the dilemma of whether or not to take a photo of a scene of a child living on a rubbish dump. As it happens he didn’t because he worried that his taking of the photo wouldn’t go down well with the Bangladeshi host accompanying him. His motivation to take a photo wasn’t strong enough to overcome his misgivings. This conversation brought a number of thoughts back to the fore for me, including whether I would have done the same, and one of the conclusions I came to was that it would have to depend on why I was there. The man who told me this story was there just as a visitor and would probably only have shown the photo to friends and family. Had it been me, I would have wanted to show the world, but it’s actually far more complex than that. Ok, so I didn’t end up doing exactly what I’d envisaged – covering conflict, famine, disaster and so on. My career took me in other directions and perhaps for the best, if the mental state of your average war photographer is anything to go by. And besides the lucky coincidence of self-preservation which comes with not putting yourself into conflict zones in order to take photos, there are other reasons why I would feel uneasy now if I were to find myself in a position to take pictures in some of the more troubled areas of the planet. For one thing, I’ve always wanted to take pictures because someone else asked me to. I’ve never been particularly good at pushing myself to take photos in difficult circumstances if I didn’t have a client commissioning me. A commission serves two purposes; firstly that I know someone already wants the photos I haven’t yet taken and secondly that they’re paying me means I’d better damn well get the photos or I’ll break the trust of my client. These motivations are powerful and to me they’ve always justified my existence as a photographer. There is also another reason I don’t think I could cover the suffering of others so easily now. Back in the early days of photojournalism while cameras, film and processing chemicals were never cheap, basic kit didn’t have to be insanely expensive and the good you could do by taking a set of photos and getting them published in a national or international magazine would be palpable. Governments could be forced to change policy (or brought down) on the strength of a photo essay in The Sunday Times or Observer magazine. Now things seem to have got rather out of kilter. Even the biggest magazines have dwindling readerships and diminishing influence, while the kit required to cover the stories which need to be covered has become ever more bling. Many of the photojournalists of the 1950s and 60s used Leica and Contax cameras. These were never bargain-basement makes, but Contax no longer exist and Leica really only make cameras for the collector now. Indeed it would be obscene to go into a famine-ravaged country holding a camera which costs £6,000 (plus lens for another £1,000 or so) to take photos which too few people to make a difference would see. And if I were asked to go into such a situation, I’d need a main camera plus a backup. Even a modest SLR set-up is a few thousand Pounds Sterling. Could I shoot poverty and not be pricked with irony? I’d sooner shoot film with a cheaper camera, but few film cameras are manufactured now and reliability is becoming an issue for those which ceased production many years ago. Mostly they’re either junk, or they’re expensive collectibles, again notably Leica. It seems the tools we used to use in order to penetrate the more poorly-illuminated corners of humanity have become fashion accessories in the form of our mobile phones or the retro-cool cameras which beguile use with their promises of classic styling enabling us to take classic photos. I own a Fuji X20 so can’t throw stones here. 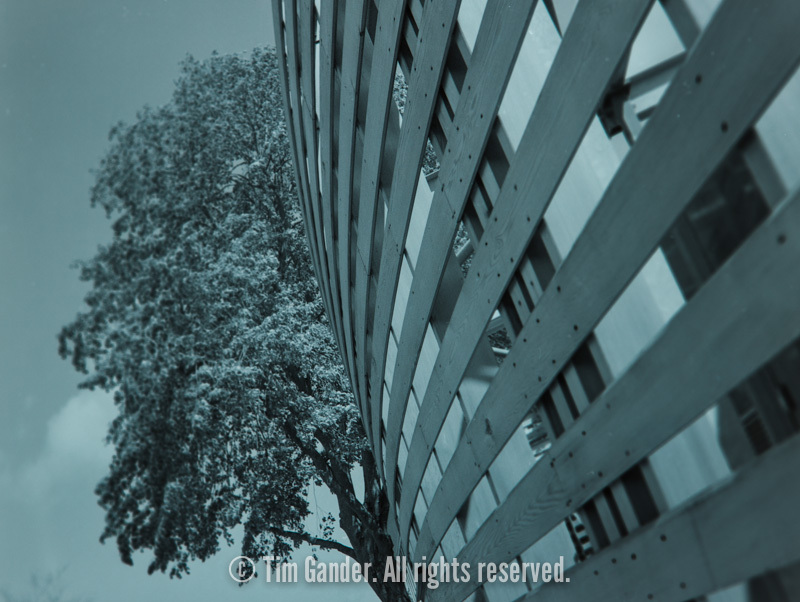 And the more photos we take, the fewer we take of the things that truly matter to society. This isn’t to say I don’t believe in what I do, and I work hard to make my pictures the best they can be, but I’m under no illusions that the work I produce is going to change society. My motivation now is to give my clients the very best images I can, and provided I can stay fit and healthy I’m really only about half-way through my career, so plenty of motivation to keep doing that. What I can’t quite shake off is the regret I feel when I see how photojournalism is caught between a lack of commissions for the best photographers (of which I do not count myself), the hopelessly low fees paid by publications (another reason I’m no longer in newspapers) and the eye-wateringly expensive kit required to do the job as demanded by the industry. It doesn’t seem healthy to me, but neither is a solution forthcoming. All I can say is that my motivations now are different from when I first started, but at least now I have a better idea what those motivations are even if I’m still not sure what my ethos is. I think I might POP! This is one of those “apropos of nothing in particular” sort of posts where I just update you on what’s been going on lately. It will also explain why I didn’t post last week, and why this week’s post is late. I apologise for both failings. To say things have been busy would be an understatement. I’ve been incredibly hectic with work for University of Bath since their lovely and wonderful staff photographer Nic broke his collarbone in a cycling accident (or did I sabotage his brakes as one client suggested?) Of course I wish Nic a rapid recovery, especially as having broken my own clavicle a few years ago, I know just how ruddy painful it is. I found out about Nic’s mishap while I was working for two clients in London a couple of weeks ago, and since then it’s been full-on with assignments in London (again), Gloucester, Bath and even Chard in Somerset; not somewhere I get called to regularly, but work is work and the session was a fun little PR piece. In amongst all the professional fun and games I’ve been finding a little time to take photos for fun. 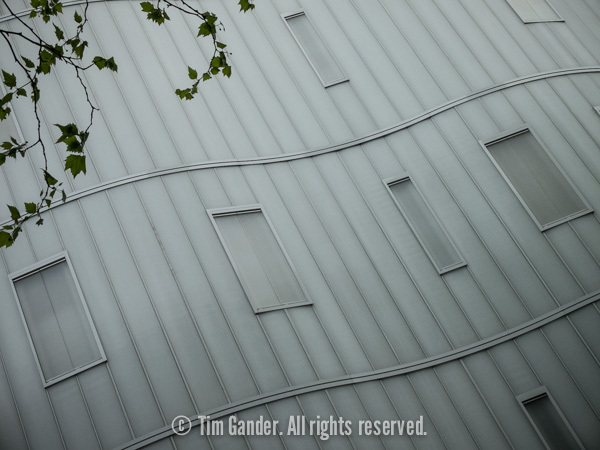 While in London I got to stroll about with my Fuji X20 one evening and came up with this shot. Perhaps even more exciting was when I discovered a classic 1980’s camera, a Konica Pop, in a Frome charity shop and snapped it up for the princely sum of £15. I popped a roll of black and white film through to see what it could do and I have to say I’m impressed! Not that I’ll be using it for client work. It’s a bit hit-and-miss, but I’m sure I’ll be using it for more fun stuff soon. You’ll have to be patient for that though because the coming weeks don’t look like they’re going to let up much. I’m going to have to beg your forbearance if my blog posts are occasionally late too, but at least you’ll know it’s because I’m busy rather than that I might be ignoring you. I could never do that. Q: What’s the difference between photography and bread? A: There’s a lot more dough in bread. That isn’t just a random (and very painful) joke, there is a photography/bread theme to this week’s article. It’s fair to say that since the start of this year, bread-making has become a bit of a hobby for me. Actually, it’s become something of an obsession, and I think I’ve discovered certain links between the passion I put into my photography and that which I invest in my bread. It’s all about using rules while not sticking rigidly to them, attention to detail while also observing the gut instinct to make adjustments where necessary and both are creative processes where the outcome reflects the un-observed effort which goes into their production. All this, perhaps self-indulgent, ruminating came about at the weekend, but let me explain the background first. In August 2012 I was commissioned by Biotechnology and Biological Sciences Research Council (BBSRC) to go to Newcastle University to take some feature photos of Dr Matthew Wilcox and his team who have been working on measuring and maximising the health benefits of alginate as a food additive. 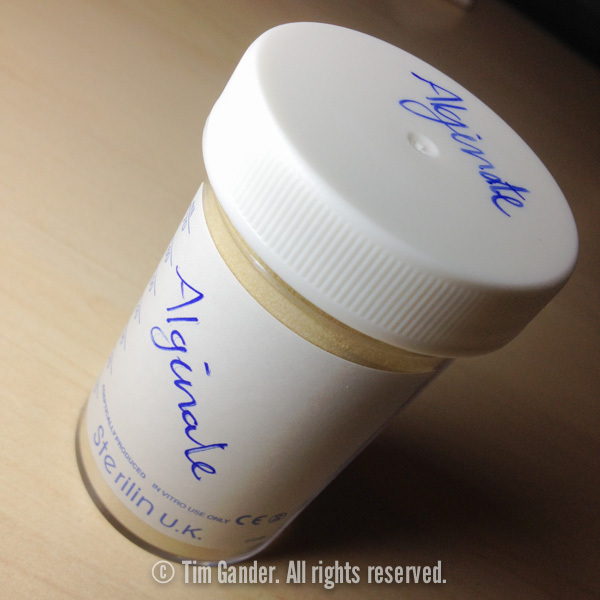 Now I can’t give the full scientific breakdown of Dr Wilcox’s research because I’m not a scientist, but in a nutshell alginate is a compound found in seaweed which raises the fibre content of foods to which it is added and may also help with weight loss. When I next met Dr Wilcox he was a finalist of BBSRC’s Fostering Innovation awards event in London earlier this year and I mentioned I’d got into bread-making. He offered to send me some alginate to try in my bread. Again, like photography, if someone offers you a new ingredient to try, you jump at the chance. Last week a package arrived at my office containing a note from Dr Wilcox and a small container of alginate and with great excitement I got to bread making on Saturday. While I don’t want to bore you with a blow-by-blow account of my bread making methods, here follow my not-very-scientific observations of making bread with alginate. I made the dough using my usual methods, but added the alginate powder with the yeast at the start. It was when I came to knead the dough that I noticed the first difference. The alginate acts as a bonding agent, and because I do all my kneading by hand I had to work pretty hard for 15 minutes to get the dough to the stretchy, bouncy state I like. I was a little concerned, but on the plus side, when it came to shaping the loaves I noticed I could get the dough much “tighter”, which is always good. What I hadn’t expected was the bread to rise so much in the oven and for the bread to turn out quite as light and delicious as it did! I’ve baked wholemeal loaves, white loaves and normally work a mixture of the two (Saturday’s loaves were 50/50 wholemeal and white), but I’ve never had any rise so vigorously in the oven as these did. The finished loaf – tasty and with a lovely texture. And good for you! The resulting loaves were big and crusty, and once they’d cooled I cut one to discover it had a lovely colour, an open, light texture and smelled amazing. I had to try it just with butter (my standard bread-tasting test) and was delighted with the flavour and texture. My son tried some too and said it was really nice, so that’s a bonus. 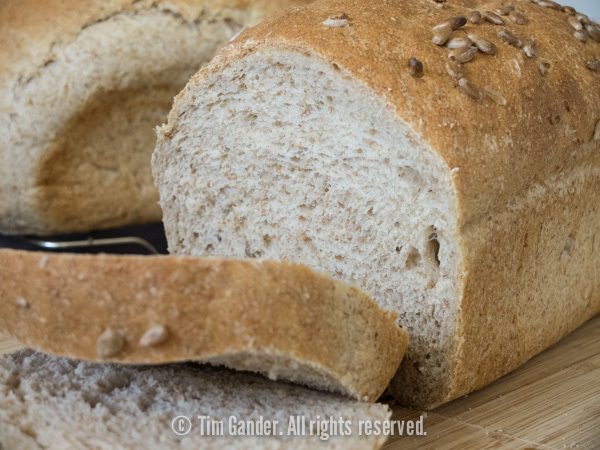 Now I’ve run out of photography/bread similes, but if I really wanted to stretch the point, the thing you knead to know is that while my photography earns me a good crust, my bread isn’t crummy either – d’ough!